This simple recipe for Bohemian-style roast duck is delicious when served with Czech bread dumplings and Polish braised red cabbage. Duck or goose was too expensive for everyday eating, so this was a special-occasion meal in my family unless you were one of the szlachta (nobility). My sister has less-than-fond memories of making friends with the duck busia bought at the live poultry store only to witness its demise and its blood drained for czarnina soup. Luckily, I was spared these Kodak moments. Leftover duck can be used in cooked-meat pierogi filling, as stuffing for mushrooms and more. Wash and pat dry inside and outside of duck. Cut wing tips off, and excess fatty skin around the neck and from the cavity. Pierce the duck fat all over with a fork, but do not pierce the meat. Liberally salt exterior and interior of duck, rub with garlic and sprinkle with caraway. Place duck breast-side down in a roasting pan with a lid and cover. 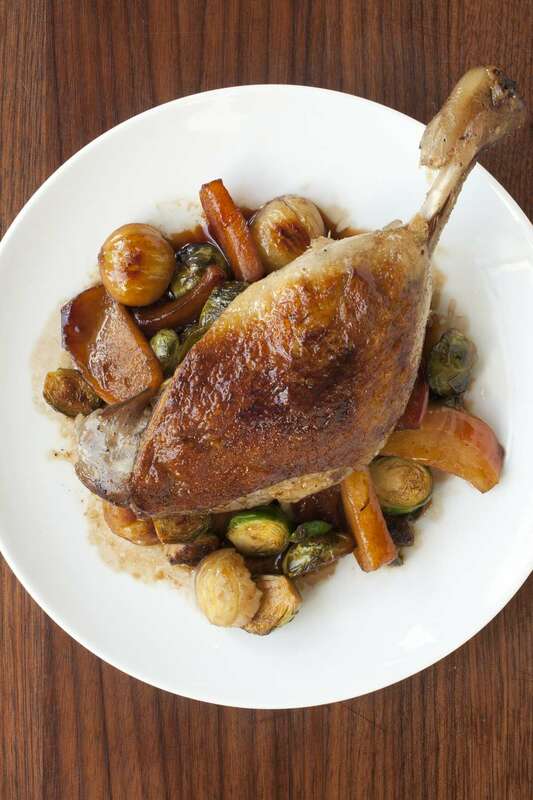 If duck is right out of the refrigerator, let sit about 2 hours to come to room temperature. Pour 1 cup water in the bottom of roasting pan. Roast duck 1 hour, skimming off excess fat. Turn duck breast-side up and continue to roast uncovered for another hour, basting often, or until an instant-read thermometer inserted into the thigh registers 150 F and the skin is golden. Remove from oven and let rest 10 minutes before carving.